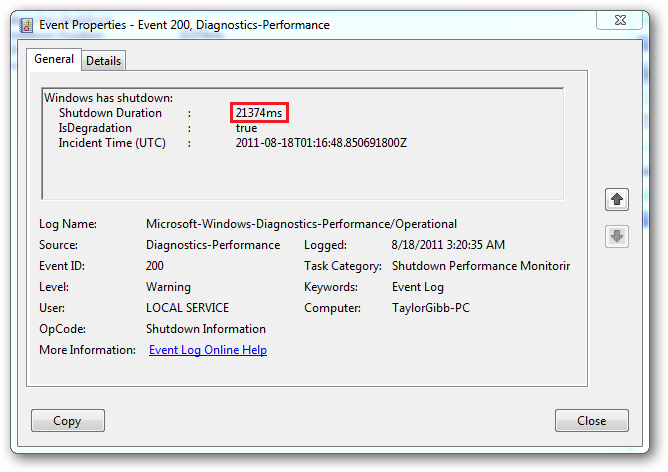 The Event Viewer in Windows 7 provides us with an easy way to track any error or warning messages. 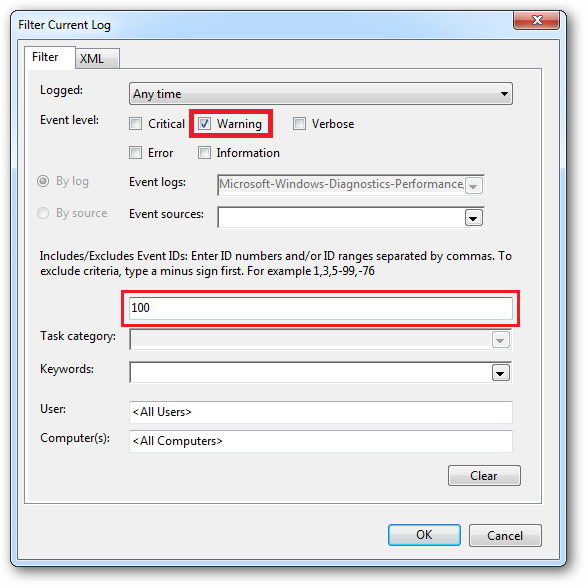 What you may not know is that every event in Windows gets logged in the event viewer. If you know the right place to look you can even find boot and shutdown information. 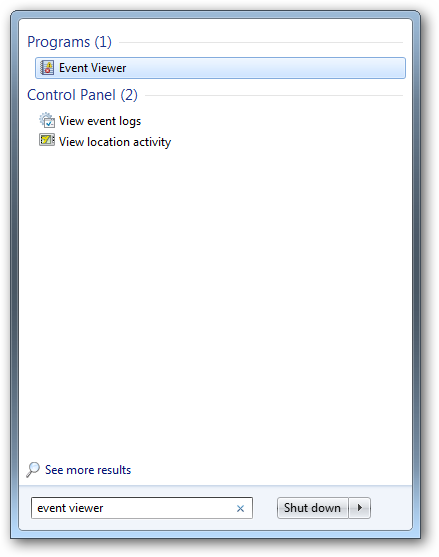 To open the event viewer type “event viewer” into the Windows Start Menu search box and press enter. 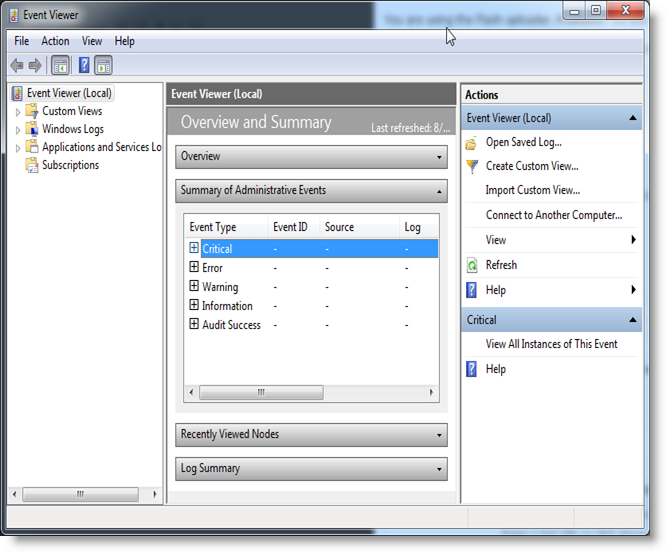 After the Event Viewer has opened, you’ll be greeted with an overview of whats going on in your system. Since we allready know what we looking for you can drill into the Applications and Services logs on the left hand side. 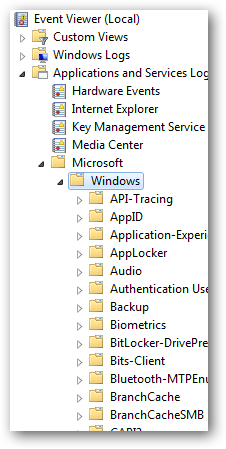 Then drill into the Microsoft section, followed by Windows. 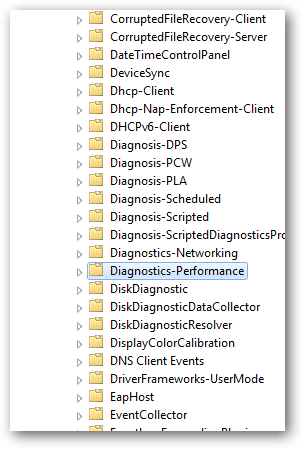 Now we are looking for a folder called Diagnostics-Performance, this folder houses a log called Operational. 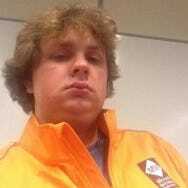 Click on this log to open it. On the right hand side click the filter option as pictured below. To make things easier Microsoft gives each event an Event ID, with these you can filter the event logs to get to your information even quicker. You should tick the Warning box and specify an Event ID of 100, it should look exactly like the picture below. Once your screen looks the same, click ok. The filter will sort through the log and only bring up events which have an Event ID of 100. Click on the header of the Date and Time column to sort the log in ascending order. In the picture above my boot time is 38889 milliseconds, to get that in seconds you have to divide it by 1000, so 38889/1000 = 38.89 seconds. To find your shutdown time, all that is required is to, apply a filter with different criteria. Like the startup time, the shutdown event also has an Event ID, to find shutdown events you should specify an Event ID of 200 as well as tick the Warning box. Click on the header of the Date and Time column to sort the log in ascending order. In the picture above my boot time is 21374 milliseconds, to get that in seconds you have to divide it by 1000, so 21374/1000 = 21.37 seconds. 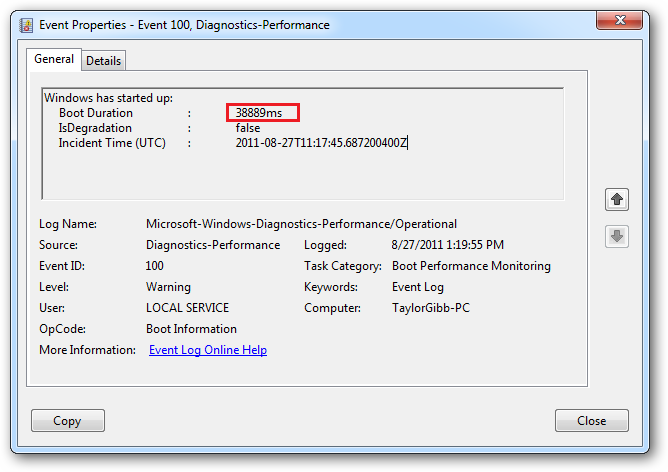 **Note that you will only be able to see a benchmark in the event log if you have installed a few programs on your pc.